We are looking forward to our next Producer’s Table winery, Myattesfield Winery. On Saturday Feb 2nd, at 1pm. Located in the Bickley Valley in the Perth Hills the climate is similar to Spain and Portugal which encouraged the team to plant the varieties Verdelho, Mourvedre, Touriga, Brown Muscat and Durif alongside Shiraz, Cabernet Sauvignon, Merlot and Petit Verdot. 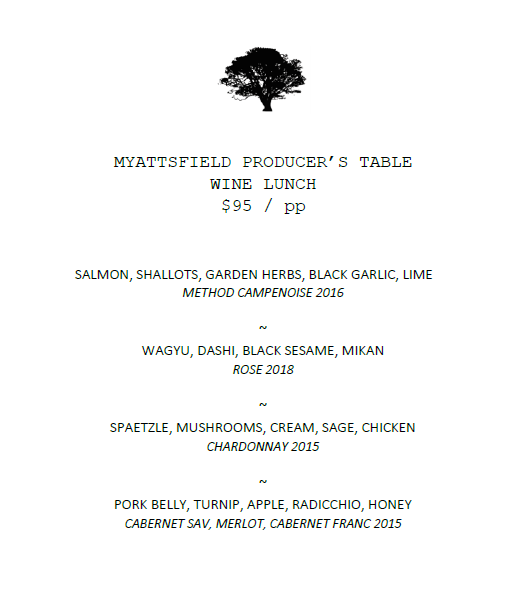 MyattsField was established in 1997 and is currently run by winemakers Josh and Rachael Davenport. We are welcoming them down to share there wine with us, paired by our kitchen with some incredible dishes. This is an intimate event with only 28 spots available so get online and grab yours today!